Sandy is also looking for a Herrschner’s pattern. I’m looking for the Herrschners Award Winning Baby Afghans 2002 pattern book. I want to make the pattern called “Baby Blueberry Gingham”. The pattern is white and blue blocks. Thanks for trying to help, I really appreciate it. I know of 3 young girls who are having babies within the next couple of months, and this would be a unique beautiful blanket to crochet. I’m going through a divorce, and this is my therapy. 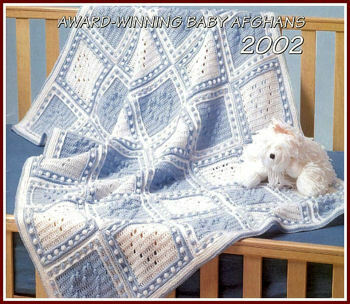 looking for the award winning afghan 2002 book.I would like the pattern for the Baby Blueberry Gingham or the kit please. I am looking for this pattern, also. It is no longer posted on the Herrschner’s site. I am also looking for this pattern. Has anyone had any luck finding it? I have this pattern if you would like a copy. Can I add myself to the list of people asking you for the baby blueberry gingham afghan pattern? Can anyone help me get this pattern I am desperate. I can send it to you. Please send me your email address. Hi Lori~ Can I get a copy of Baby Blueberry Gingham Afghan pattern. I will gladly pay you for a copy. I’m working on a way to make this pattern available to those who need it. You will need to join our Facebook group – https://www.facebook.com/groups/plushmemories/ and request help finding it.